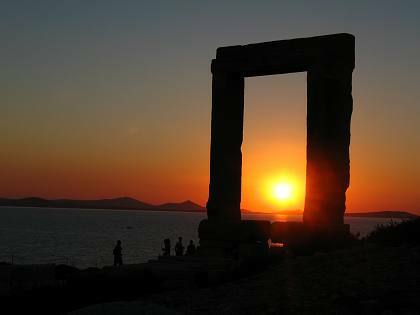 Portara is the huge entrance (6 metres height, 3.5 metres width) to the temple that Naxos tyrant Lygdamis began building on Palatia Islet. Further north of Palatia (in Grotta) are remains from the Mycenaean period. The Venetian Castle and Glezos (Crispi) Tower (goes back to the era of Venetian rule 1207 - 1564 AD) - Border tower protecting the Castle of Sanoudos in Naxos Town. The wall surrounding the fortress is pentagonal and has three gates. Glezos Tower (Crispi) stands near the northwestern gate and extends in part along the western and northern side of the Castle. 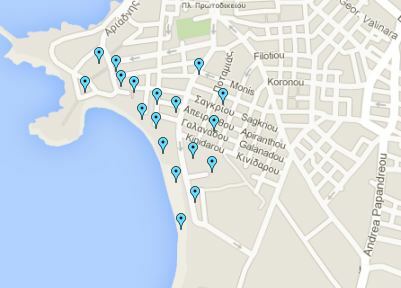 It has four floors and it is the only castle in Naxos Island with a round tower attached to it. 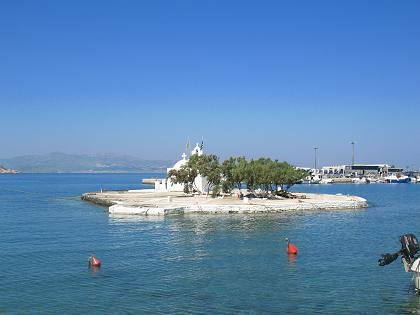 Panagia Myrtidiotissa Church - Built on an islet in the harbour of Naxos Town. 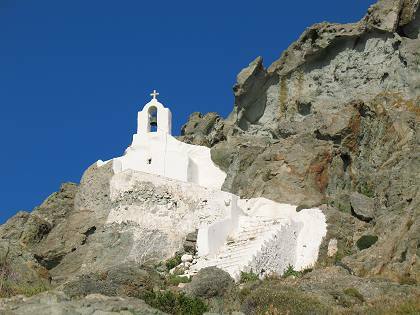 Theologaki Church - Built in a cave with frescoes since 1200. Archaeological Museum - with findings dating from the late neolithic period to early christian times (5300 BC - 5th century AD). The School of Commerce (founded by Jesuit monks) and Ursulines School - Nikos Kazantzakis, the Cretan novelist of "Zorba the Greek" studied in the School of Commerce which today houses the Archaeological Museum. Paraporti, at the southern Gate of the Castle, leads to Nio Horio district where once the poor people lived. The Old Market around the Venetian Castle blends perfectly with it. A maze of narrow streets, lanes and arches makes it very attractive, more than beautiful.